Love the ramming mechanism on the prow, Astrid [or Rino]. That would be some job! Excellent examples, Astrid! 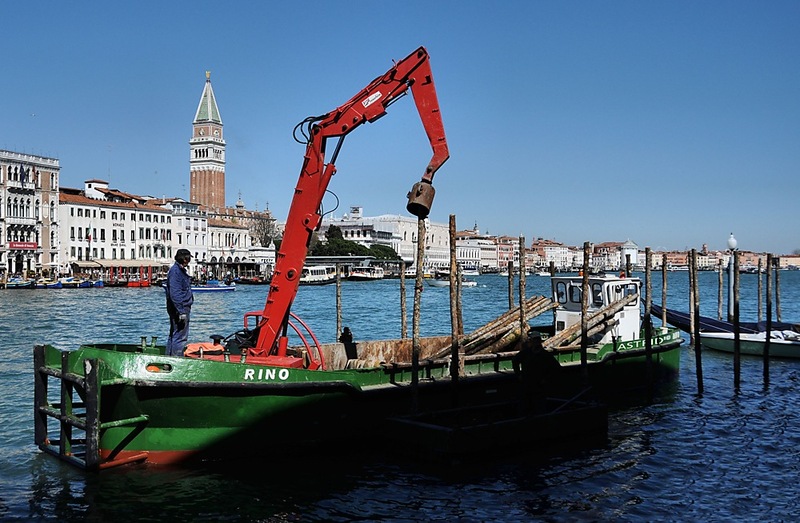 Looks like these Italians are trying to build a cage to keep their vicious boats in Astrid.. It was quite an education, Astrid, watching this exhibition of ramming in the poles. But, yes, sh** happens. After breaking off the top, they kept ramming it in. I could have warned him that this might happen Astrid. Picturit: We both saw it coming and we rolled our eyes... they just kept hammering HA. Oh, oh. I have a friend named Rino, an unusual name. Picturit: That is an unusual name indeed, isn't that short from rhinoceros??? Perhaps they don't grow very strong poles round Venice way. What a place to work! Even mundane jobs must be interesting. It's rather hard to figure out what they are trying to do! Picturit: They make rows of poles in between boats/gondolas can 'park'...in the top picture you can 'see' the space in between them. Well the work must be completed and lunch time is near. Love all the comments! Typical men at work...just keep ramming the pole, ha ha! Picturit: Don't you love it, we watched the whole process and we were just smiling... what a guys...'men' indeed..
Picturit: Thank you, Peter, Ginnie and I had fun watching the process too.